This year, the New York City Sea Gypsies will be once again diving in the Thousand Islands! We are planning four and a half days of diving over Labor Day weekend, driving up Wednesday afternoon, August 28th, diving Thursday, Friday, Saturday, Sunday and Monday morning, returning home on Monday, September 2nd. This is a terrific opportunity to dive some fantastic wrecks in fresh, clear waters near 70°F, all within a half day's drive from home. The Thousand Islands is the name given to a beautiful region along the St. Lawrence river, which is the border between New York State and Canada. The river flows from Lake Ontario to the Atlantic Ocean, and has been a major shipping channel for a very long time. The river has numerous submerged islands, rocks, and shallow shoals, which have caused many ships to run aground and sink over the years. Some of these are wooden ships that date to the 19th century; thanks to the fresh water, they have been preserved in excellent shape. Zebra mussels (an invasive species) has helped to clear the waters providing great visibility, sometimes up to 50 feet. You might assume that this is cold water diving, but that's not the case. Although the river does get cold in the winter, it is fed by the top layer of Lake Ontario, which warms over the summer. During our trip, we expect water temperatures in the low 70s, top to bottom with no thermocline! A 5 mm wetsuit is adequate for many divers. These wrecks can be accessed from either the US or the Canadian side of the river. We have found that staying on the Canadian side is preferable, with diving amenities being more convenient, diverse, and inexpensive for recreational divers. When diving from either side of the river, you will need to cross the International boundary on your dive boat to access some of the wrecks, but it is easier for Canadian boats to cross into US waters than the reverse. To join us on this trip, you need a passport, passport card, enhanced state driver’s license for border travel, or a NEXUS card. We have reserved 9 spots for diving and lodging. We will be staying at the Brockville Holiday Inn Express, where we have reserved three suites with three beds each. We will be diving with Abucs Scuba Charters, and get our gas fills at Dive Tech. The plan is to allow enough time over each wreck to let recreational single tank divers do two dives, while allowing technical or CCR divers to do a longer dive. 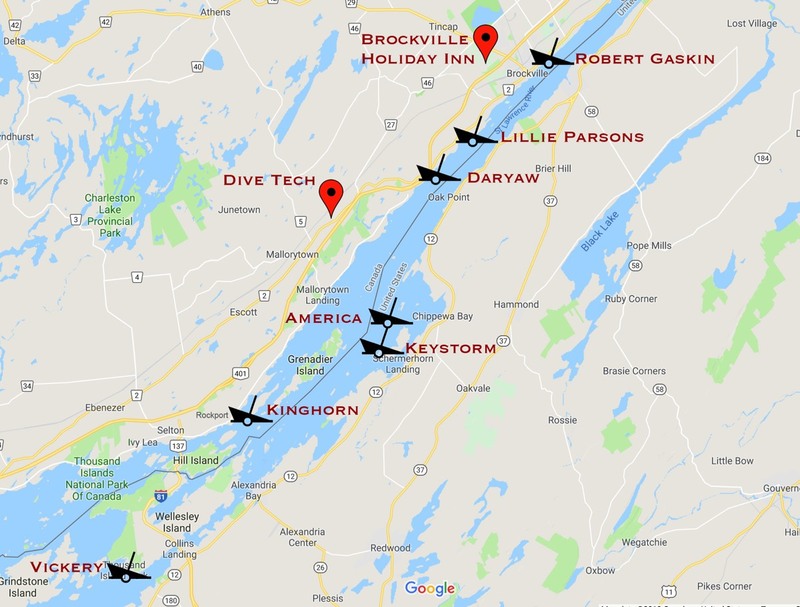 For more information about the Brockville/Rockport area wrecks, click here. Shore and/or night dives are also possible options. To reserve your spot, we need payment for the diving ($600 USD). Housing and transportation costs can be paid at a later date, although those of you who want to share in the hotel arrangements that we have made will need to cover that by the 8/1 deadline. Transportation will be organized once we have filled our roster, since some people may prefer to drive on their own for flexibility, or to make other stops along the way. If everyone wants to drive together, we could rent a large passenger van for approximately $150 per person. As with all Sea Gypsies trips, the club does not provide training, guiding or buddies. We do not vet divers - you alone are responsible for determining your fitness for each dive. While these dives are all within recreational depths, there are special challenges associated with diving in a river current. Please discuss the local conditions with the dive operator if you are not sure if this trip is appropriate for you. Cost of diving: $600 US. This includes tax, but not crew tips, gear rental or gas fills. Possible minor variations due to Canadian dollar exchange rate. Transportation: Group van rental an option (approximately $150/person), or individual cars. To be determined once roster is filled.